ranch (rănch) n. Rectangular style building, with a shallow-pitched roof. Although ranch sheds are commonly used to describe many types of sheds, they generally feature a gable or 'salt box" style roof with doors positioned on the eave wall. Ranch sheds are a favorite of those looking for more stand tall room inside. They offer great curb appeal making them a popular choice to be used as a workshop, hobby room and home office. Ranch style roofs serve numerous functional and decorative purposes. This style is ideal for adding an optional window. 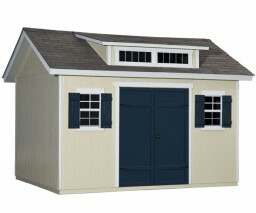 Also check out our Gable sheds or Gambrel sheds to see which style might be best for you. Our selection of ranch sheds is perfect for the weekend warrior who needs a strong and practical storage solution that provides easy access. We focus our designs on providing unique styling and functionality that anyone can appreciate. Thanks to our highly refined manufacturing process, we pass the savings to you without sacrificing quality. 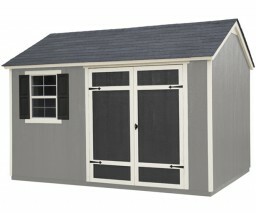 For your convenience, our professional installation team can install your shed right in your backyard. 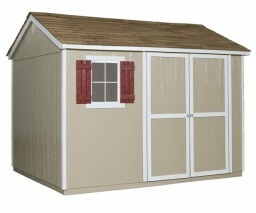 Our ranch sheds have exceptional features that will protect your investment from the elements. Each building has a strong wood framing that can withstand heavy wind and snow loads. Next, our engineered, treated wood siding shows off a beautiful finish while maintaining resistance against rot, decay and insects. To top it all off, 25-year asphalt shingles are standard on our buildings for a long-lasting protection. Backed by a 2-year top-to-bottom warranty, our storage solutions will keep your most cherished items safe and secure for many years to come. Consider this website a blank canvas to customize your favorite shed to match your lifestyle. To provide easy access for ATV’s, tractors and lawn mowers, add metal ramps. To help ventilate your shed and keep it cool during the summer, add wall vents and a venting skylight. For the ultimate workshop, try adding a workbench and shelf too. Best of all, you can create your ideal storage solution online from the comfort of your living room.